Dazu is a county at the southeast corner of Sichuan Basin, 171 km east of Chengdu, the provincial capital. In the county there are in over 20 sites several ten thousand of rock sculptures carved in Tang (618-907AD)and Song Dynasties, those of Song Dynasty (960-1279AD) are especially large in number, which are generally referred to as Dazu Rock Carvings (or Dazu Grottos). 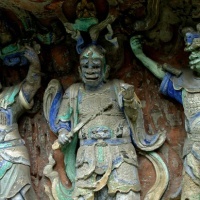 The carving began in 650, the first year of Yonghui Period of Tang Dynasty, went on through the Five Dynasties Period (907-960AD) and prospered in North and South Song Dynasties (960-1279AD). The rock carvings are mainly clustered in Dazu County, at North Hill, Baoding Mountain, South Hill, Rock Gate Hill, and Shizhuan Mountain, which are the representation of the later and mature grotto art in China, renowned for their large scale, refined carving, and varied motifs. 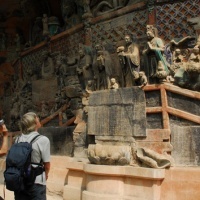 Altogether there are as many as 75 sites of grottoes with over 50,000 statues and inscriptions of more than 100,000 Chinese characters, reputed as "with everything found in all Buddhist classics" and with the prefect integration of humanization of deity and apotheosis of human beings in artistic creation. 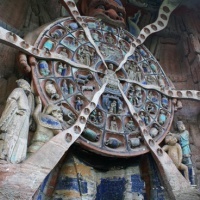 Dazu Rock Carvings also differ from the earlier grottoes in bringing together the statuary gems of all the "three religions of China", namely Buddhism, Taoism, and Confucianism. 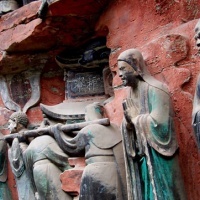 The statues on the cliff lace of South Hill, for example, are representative Taoist statues carved during the 11th to the 13th centuries, which are the most exquisite and complete of the time. 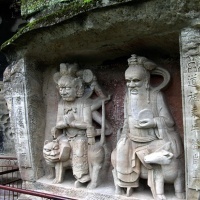 The Confucian statues on the cliff face of Shizhuan Mountain, focused on Confucius, are seldom found in other grottoes. 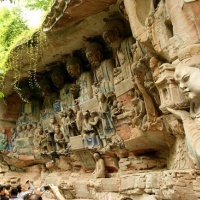 In addition, statues combining Buddhism, Taoism, and Confucianism carved on Shizhuan Mountain, as well as those combining Buddhism and Taoism carved on the cliff face of Rock Gate Hill, are also very hard to find in grottoes elsewhere. With a great wealth of visual images and written data, Dazu Rock Carvings reveal from all aspects the vital development of the art style of Chinese grottoes and the folk religious believes from the 9th century to the 13th century. They bear a historical, artistic, scientific, and aesthetic value that none of the earlier grottoes could possibly have. "Pilgrimage to Mt. Emei in Emei City if going up or to Baoding Mountain in Dazu County if going down", this folk saying proves Dazu as a site of interest since ancient times, especially its North Hill and Baoding Mountain which are always crowded with tourists, pilgrims, and preaching monks. Every year on the 19th of the 2nd lunar month (believed to be the birthday of Avalokitesvara), tens of thousands of visitors would rush in to Banding Mountain, the "Holy Mountain on paradise land". In December of 1999, UNESCO inscribed Dazu Rock Carvings on the World Heritage List as a cultural heritage.